Evan McMullin sat down with BETTER to talk his career, tough moments and coming together as Americans. Evan McMullin has a message that we can all stand behind: "It is almost always possible to find meaningful common ground and it’s certainly possible to do that with our fellow Americans." 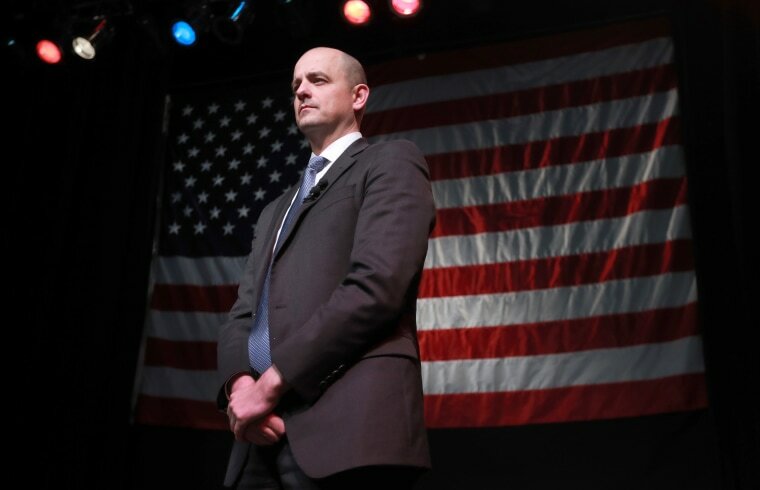 McMullin has been a familiar face and force in the United States government for quite some time — and recently even ran as a candidate in the 2016 presidential election. The 41-year-old's career took off in 1999, when he first joined the Central Intelligence Agency (CIA). For about a decade, McMullin served as a clandestine officer, spending a large majority of his time overseas focused on terrorism and traditional intelligence. After his time with the CIA, he worked a stint in investment banking at Goldman Sachs before rejoining government service in 2013, first as Senior Adviser to the Foreign Affairs Committee and then as Chief Policy Director to the Republican Conference in the House of Representatives. McMullin made his biggest splash in politics in August 2016, when he announced that he was running for President of the United States as an independent conservative. Despite his defeat, the former CIA agent is still pushing hard for change in the country. He is one of the founders of Stand Up Republic, a community that is aimed to protect democratic values, norms and institutions in America. NBC News BETTER sat down with McMullin at the Forbes 30 Under 30 Summit and talked about his early career, how he deals with conflict and even got a peek into his morning routine. My career started off with a dream I had when I was in high school, not a literal dream, but a strong desire to serve the country, my country, and to do that through working with the CIA. And that started because my dad brought home a spy movie once and we watched it as a family and it captured my attention. From that day forward, through high school and college, all I did was think, drink, sleep, eat, you know, in effort to become employed by the CIA. And that’s how I started. In college I was hired and began my career with them. What has been your inspiration throughout your career? What inspired me first was just the knowledge of an opportunity to serve the country by working with the CIA. I think that’s a big deal, I think as a young person being introduced to opportunities to serve is a powerful thing. For me, it started with the movie about the CIA, but then I read every book I could get my hands on and educated myself about the more serious side of the work. My family doesn't have a very extensive history of serving the country or the military, so that wasn’t part of my experience. But learning about service with the CIA was something that provided a window of opportunity for me. When you lose yourself in service of others, in service to the country, you find yourself in a way that you can’t when you focus on yourself exclusively. What was a difficult moment that made you better in the long run? Look, there are many — to choose one is difficult. But on that theme, 9/11 and the September 11th attacks of 2001. I was in Washington DC at the time and witnessed those and that was a really trying time for our country and it was a trying time for individuals like myself who are working in the government and responding to that. But, I benefited from it I guess because I was forgetting about myself and focusing on how I can serve and I think that’s true about service. When you lose yourself in service of others, in service to the country, you find yourself in a way that you can’t when you focus on yourself exclusively. How do you tackle difficult issues? I think it’s important in this political environment and in our country that we always remain committed to our most foundational principles — those that are contained in the Declaration of Independence and our other founding documents — especially equality of all men and women and the inherent liberty of all of us, meaning that we are naturally free that is a self-evident trait of all human beings. I think that needs to guide us in our politics today in America. And then secondly, I would say it's important to find common ground with fellow Americans and anyone else who we deal [with]. There is always common ground between human beings. I’ve lived around the world, I’ve dealt with some very, very, tough people all over the world, and I can tell you that it is almost always possible to find meaningful common ground and it’s certainly possible to do that with our fellow Americans. It is almost always possible to find meaningful common ground and it’s certainly possible to do that with our fellow Americans. I can’t say I’ve perfected the work-life balance answer; I am struggling with that still. I suspect I will struggle with that the rest of my life, but I will say that the things that bring me peace are my faith and exercise when I do it, which is not nearly enough, but a good long run does it for me. Any time in the mountains or on the beach does that and time with good friends is important. I think, again, serving other people, even outside the typical routine of your job, finding ways to serve in your community, is a great way to recharge and re-power yourself for your tasks. My typical morning routine, ideally, is I get up, I read. I try to read the scriptures; I’m a member of the church of Jesus Christ of Saints Mormon. I try to pray, then I read the news. Typically, what I read in the news then spurs me into a day of activity in addition to what I already have planned. That’s my morning routine. What really drives me these days is making sure that we protect equality and liberty in the United States of America and that’s something that drives me all day long, every day right now. The advice I would give to my younger self would be to focus a little bit more on my personal life and try to find that balance, even though it’s very, very difficult. It’s so important and hard to do when you want to make a difference in the world and have a positive impact. A CIA boss once told me when I was in my late twenties that I needed to focus on my personal life or I was — well I won’t say, but he projected some very negative outcomes for me if I didn't start focusing on my personal life. And I realized his comments reflected some of his own experiences, so I’m passing that along to you. Focus on your personal lives. Always try to keep it in balance. I say that as someone who has absolutely no experience doing that, but I know it’s important. Do you have any tips for getting things accomplished ? One person alone rarely achieves, or performs as well as teams, as groups, can. Have a plan and work well with the team so you aren’t pulling alone. It’s important to organize and delegate, that’s critical. Or organize and share responsibility. One person alone rarely achieves, or performs as well as teams, as groups, can. So, there is just tremendous value. If you are an ambitious person wanting to make a difference, you may always be the type of person who just wants to get between point a and point b in the most direct way possible, regardless of how it will impact other people’s feelings. I would say to check that and realize that bringing people along in the process is absolutely critical and will make you and your goal and your efforts toward your goal more effective. I’m very focused on defending our democracy. I feel that democracy in the United States and also in Europe, is under pressure by both internal and external forces. I just think it’s absolutely critical that we maintain a government of self-rule, accountable to the people that respects our inherent equality and liberty.